The soldier of the future will probably differ a great deal from the soldier of today, or yesterday. Advances in technology and tactics are continuously changing the battlefield and it will continue to do so. The Roman Phalanx for instance gave the ancient Romans a massive combat advantage over their less sophisticated enemies. A machine gun employed properly would butcher spear wielding tribesman. A nuke would slaughter an army of machine gunners. A satellite weapons system would be able to kill ground units with relative impunity. Still, at the very root of it, all it takes is a spear, in the right place and time, and the soldier commanding the advanced satellite system is dead. The British were still killed in the 1800’s when faced by the Zulu tribes, despite their machine guns, and the Roman Empire still fell to a less sophisticated enemy, despite their phalanxes. Combat is not just about weapons. A .357 magnum revolver is useless if the shooter can’t find a target. A nuke is worthless if the enemy is too close and the guy with the nuke is opposed to suicide. The Roman phalanx would not have been nearly as effective without their large shields that created veritable walls. The Vietnamese would have been easily defeated if only the US knew where they were and what they were up to. As weapons change so does equipment. Powered armor would not be designed just so a trooper could punch his way through walls and seeing in the dark is just one of the many uses a special visor could be used for. It is coming to a point where a regular camaflouge uniform is not enough to help protect a soldier. Ground radar units can pick up infantry, automated sensors deployed in a variety of ways can warn defenders of an approaching enemy. If a military can find the enemy then they can kill him and a warrior no longer has to see his enemy to kill him. A radar signature can be enough for the soldier to call in artillery on a suspected enemy. Infrared detectors can detect a person’s body heat, and infrared detectors are man portable. Satellites can count eggs on a table, combined with special search software and a space to ground weapon system any enemy target in a designated area can be targeted and killed. Technology is moving in this direction. Many writers like to ignore present technological trends, mostly because they don’t know about them. Furthermore, a trooper of the future is unlikely to be dressed in regular camouflage utilities. With the growing number of sensors the utilities will have to be treated so they absorb radar, infrared signature and the like, which will make them heavier and more expensive. Today, United States troops are equipped with uniforms that are treated and help mask infrared signature. It is a simple treatment on their camouflage uniforms that most aren’t even aware of because they come from the factory pretreated (part of the reason they are told not to starch their uniforms is that it ruins the treatment). 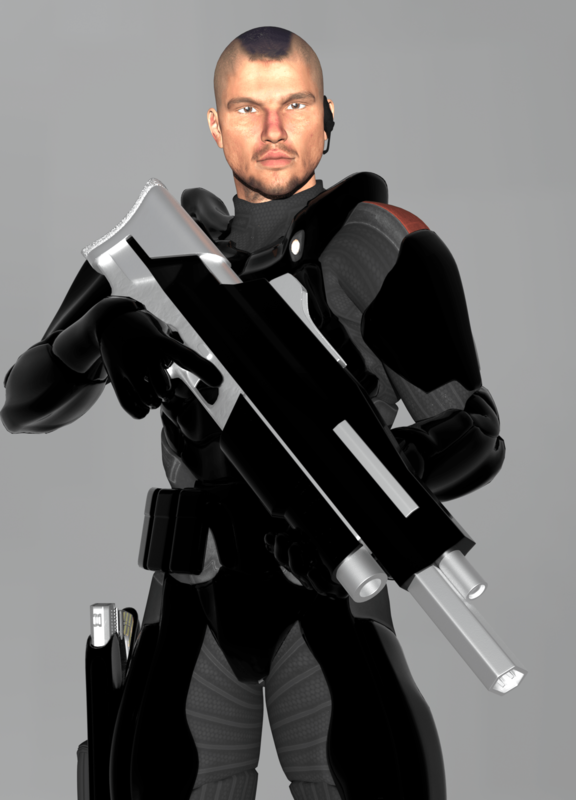 As weapons and detectors become more advanced so will the standard equipment of an infantry trooper, because if he is detected, then the enemy will probably find a way to kill him. Concealment from enemy detection will become more and more important, to avoid death and to achieve surprise. This may be as simple as hiding behind a big rock to employing sonic suppressors, chameleon uniforms that absorb both light and heat, and electromagnetic cloaks. As the enemy becomes more elusive it will be more important to find him before he finds you. This means detectors will have to be man portable and available. Thermal imagers and electromagnetic detectors will likely be built into helmets in order to give the trooper an advantage over his enemy. Of course all the defensive measures aren’t going to do an ounce of good in the wrong terrain. It is hard to hide from satellites in the desert if you are leaving tracks, same with fighting from the ocean unless you are in submarines. As sensors become more advanced so will the countermeasures as each side plays the tech game. A uniform that simply changes to the color of the surrounding terrain may not be enough as computers are incorporated into viewing devices. A camera like visor can take a picture and then compare it with the next picture it takes. With depth perception and movement the right software can highlight any anomalies. Shadows and movement would also stand out on a viewscreen with the right software to make the target highly visible. A trooper will also have to be protected from chemical and biological agents which are becoming more common on the battlefield. A simple gas mask is not enough because many of the agents, like nerve gas, can be absorbed through the skin. Like all other technologies, biological agents, or engineered viruses, are constantly being designed and countered. If all the troops are impervious to these agents (completely sealed suit) then it is unlikely they will be used, however, if a person has his/her suit punctured, then it becomes a severe threat. Nerve Gas, Anthrax and the like can also be used against civilian targets by an uncaring enemy. An important factor in dealing with NBC (Nuclear, Biological, Chemical) warfare is how long it lasts. If a tailored virus sticks to battle armor then decontamination is going to be hell. The more technologically advanced a military becomes the more soldiers are going to have to specialize. Specialists take time and money to train so giving them some kind of armor is a good investment. Because a large number of casualties can effect National Policy it is in Nation’s best interests to provide protection for the troops. There are other things to consider. Currently US forces are equipped with flak jackets and helmets that protect against shrapnel (the number one killer) but not bullets. Many people wonder why Uncle Sam is too cheap to provide troops with bullet proof vests. Consider the threat faced by a soldier on the battlefield. With high powered assault rifles and heavy machine guns bullets have a lot more power than what a police officer would face. That means the armor would have to be much heavier (and expensive). In addition to facing higher velocity rounds there is the kinetic force to worry about. Bullets do not bounce off bullet proof vests, they slam into them leaving bruises and welts underneath the vest. If a trooper, equipped with a Bullet Proof Vest (BPV) were hit with a high velocity assault round then he might suffer broken bones, internal bleeding, ect. Internal injuries make it much harder to treat a wound. The soldier would probably be out of the fight and doctors would need a great number of specialized devices to determine what is going on inside the body. For a police officer who is close to highly advanced medical facilities that (usually) aren’t overloaded with casualties, it may be worth it. For a soldier who is much farther from immediate medical assistance it could be another story. A bullet proof helmet may stop a bullet but if it hits hard enough and breaks the trooper’s neck the point is irrelevant. Armor can (and is) built to distribute the shock of an impacting round but this usually requires trauma plates which are usually heavy and cumbersome. The more protection a trooper has the heavier it gets. Legs and arms are considered ‘expendable’ since the loss of one (or more) is not always life threatening. A wound to the body or head is another story. With an increase in armor protection comes an increase in weapon penetration. I’ve heard it said that in Afghanistan the Mujahideen used a teflon spray on their bullets and turned regular bullets into armor piercers that would penetrate Soviet BPV’s. Bullet Proof Vests will become like tanks. More armor simply means the enemy will use more effective, bigger weapons. Two more considerations that must be taken into account is weight and heat. Load a trooper down with armor, weapons and equipment and he becomes a slow moving target that waddles around the battle field, easy prey for some guy with nothing more than a canteen and an accurate. Heat is also important in all climates. In the desert it can lead to heat stroke, in the arctic it can make the wearer sweat like crazy and when the wearer stops and becomes stationary all that wetness cools him down really fast, increasing the chance for hypothermia. There is a lot to consider when dealing with armor. A fully integrated battle suit is a very practical concept. If the suit is fully self contained then it would solve a great many problems facing an infantryman. By employing environmental controls (heat and air) the trooper can be rendered immune to such things as chemical and biological agents. In addition the trooper could operate in a wide variety of environments with less trouble. For instance a frozen desert or a tropical jungle would have a lot less effect on the trooper. Problems such as heat stroke and hypothermia are always a danger to combat troops. A suit that regulates internal temperature would allow combat personnel more versatility, likely decrease the needed logistics and improve combat performance. Cold weather sleeping bags are critical in cold weather environments and heat stroke is a killer in hot weather environments. The problem with a self contained suit is weight and bulk. Heaters and air conditioning adds weight to what the trooper must carry. Added weight slows down the trooper making him an easier target to hit. If the suit is too bulky it would severely limit the soldier’s ability to take cover and fight in a house to house battle. Adding armor to a self contained suit is a great idea. The problem is the weight. Powering and maintaining the suit is another problem. With all the electronic devices the suit is probably going to need more than a pair of AA batteries. That adds weight too. One real neat type of battle suit is Powered Armor. Because the suit has strength augmentation then the trooper can be loaded down with heavier armor, weapons and equipment – right? Wrong. Infantry rely on controlling terrain that other types of units can’t handle. Jungle, cities, hills, ect. If the soldier weighs as much as a tank then he is surrendering many advantages. Powered troops in the jungle would leave footprints a child could follow. In a city the trooper would probably fall through the floor, if he could fit through the door to begin with. In a space ship an assault trooper would probably get stuck in a hatch and some guy with a knife might be able to finish him off. Then there is the cost. One major advantage of infantry is their low cost. Special battle suits would increase the cost dramatically. Logistics would also become more important. Someone has to size, repair and modify the suits or they are no more than scrap metal. As mankind takes his wars to the stars self contained suits will likely become the norm or units, especially expeditionary units, like Marines and Mercenaries. There will likely be too many different environments and ships stores can carry only so much. If the ship’s storage has to carry everything from cold weather sleeping bags to hot weather uniforms then there will be less room for ammo and reinforcements. An expeditionary unit can be defined as a unit that is deployed to a combat zone from a transport. The combat zone may be in an expected or unexpected area making the planning for deployment an iffy proposition. Space going troops may also be required to fight in all manner of hostile terrain from deep space to frozen tundra planets without atmospheres, and they must be ready and trained to do so. Sensors, readouts, optics, communications will all likely be placed in helmets. Currently the Army is researching a weapon that is being designed to integrate with helmet optics. A camera mounted on the gun will transmit a view to the user’s helmet. This will allow the user to stick the gun around a corner and fire without exposing more than his hands. Very nice if the enemy gains fire superiority. 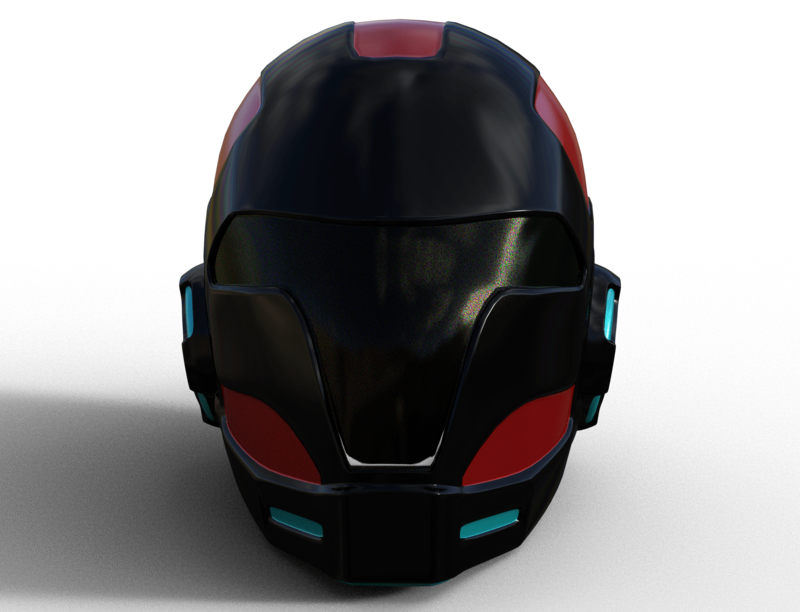 It is also likely the helmet will incorporate such features as communications and special optics like night vision and range finders. There may also be readouts for location and current ammunition levels. The helmet will have to be compatible with a gas mask unless the gas mask is built in. Chemical and Biological weapons are here to stay and when small third world countries can make nerve gas then it will have to be a consideration when designing equipment. Communications are critical and this will have to be a prime feature of combat helmets. Nations that use large amounts of poorly trained, infantry may not be interested in equipping every private with a two way radio. Some may think that a private only needs a radio to receive orders. Another aspect of communications could include status reports. By monitoring a soldiers health a watch commander would know instantly if an infiltrator killed a soldier (or if a soldier fell asleep). A simple system would help a commander keep track of how many men he has available and in what condition his unit is in. The helmet might also include a minicamera. By recording, or transmitting video images, a soldier’s actions can be reviewed later for training or debriefing. It might also give other’s a chance to patch into the soldier’s helmet view and see what he is seeing. Of course the more stuff you add, the more bulk and weight gets added. Of course miniaturization might make this irrelevant but miniaturization costs more. Most of this equipment would be located in the helmet because that is where humans have most of their senses. A camera might be mounted on a gun but in reality would probably be mounted in the helmet because people don’t always look over a wall with their weapon. Weapons carried by the future infantryman will have to allow him to accomplish his mission. They must be versatile and rugged because the future battlefield will likely be even tougher than today. An interesting trend in current weapon technology is non-lethal weapons. Killing an enemy inevitably causes hate and a desire for vengeance among the population. Evacuations of citizens from a nation that has collapsed into civil war is dangerous. By firing upon and maybe killing one of the combatants the foreigners have unwilling taken sides. A mob of frightened people cannot be repelled with lethal gunfire and sometimes massacring an angry mob is not the best option. To avoid backlash from other nations, killing civilians is to be avoided at all costs. Troops should have options available to them to prevent that. Another advance that is anticipated is cameras mounted on weapons. The US Army is currently experimenting with a weapon (the OICW) that has a camera that transmits to the soldier’s helmet. This will allow the soldier to shoot and look around a corner without exposing anything more than his hand holding his weapon. Otherwise weapons will vary according to technological ability and practicality. If a battlesuit or any other type of electronic device is used then it probably needs power – lots of it. It is highly unlikely a plasma assault rifle needs two double A batteries and gets unlimited shots. Powered armor would need a power supply along with any devices that provide electronic countermeasures. Batteries are great but resupply could be a problem. Some thought should be put into this because of the different effects it would have on the powered armor, weapons, ect. For example. Weapons might have a power charge that is recharged from a socket in the suit or the suit actually powers the weapon. As stated earlier a battle suit shouldn’t be too bulky because it will interfere with entering a building, or cave, or ship. Ideally the suit should be light weight to prevent the floor from collapsing. This is important. Soldiers are living, breathing people with regular body functions and problems. Soldiers must eat, drink, breath, sleep, defecate, urinate and may at times vomit. This presents a great many problems for designers. If a suit is designed for combat then that means the soldier could be in a battle zone anywhere between minutes to years and he/she may not have the opportunity to remove the suit. Will a soldier have to enter battle with a vomit covered visor? What about injuries? How will a soldier in a battle suit be treated? Is he even expected to survive? These issues must be answered to some extent. Depending on how society shapes people, futuristic soldiers may not be as rugged and self sufficient as today’s, or yesterdays soldiers. The newest generation joining the US Military is frequently referred to as the Nintendo Generation. Frequently the Nintendo Generation knows more about computer games than tracking or exercising. In some cases physical standards have to be lowered because the Nintendo Generation is more of a couch potato generation, not a baseball or football oriented. Soldiers will be more familiar with computers and technological devices than weapons and close combat. Of course there will always be exceptions to the rule but generalizations could be made. Due to the graphic violence portrayed in video games, television and society, soldiers may be more prone to violence. If the society is more peaceful and kind then soldiers will find it more difficult and traumatic to kill another human (or living) being. Pacifists don’t make good warriors. Training, weapons and equipment will likely be geared toward the type of recruit depending on the quality of the government. A more uncaring government may throw their peace loving troops into a vicious, lethal conflict without concern for their psychological well being. Others might think twice about it and issue non-lethal weapons. This may be a bit extreme but look at the Soviet’s method. Poorly trained troops were taught little more than battle drills. Weapons and tactics were designed for ‘ignorant peasants’. A Soviet type soldier doesn’t need to know much, just how to get out of the vehicles, and walk forward firing his weapon. If a soldier needs to be able to do more an officer will teach him. Military technology is developed to gain some advantage over the enemy or to nullify an enemy advantage. There is a great deal of talk about superweapons that will end all wars and make infantry obsolete. They called the machine gun such a terrible weapon when it was invented and they said it was too terrifying to use on humans so it would end war because nobody would inflict it on other humans. They called the tank and airplane superweapons in World War One. World War two saw refinements of this technology and the tactics used but these ‘superweapons’ did not end war. Nuclear bombs can render planets uninhabitable, they can vaporize cities and kilometers of countryside. Yet despite the availability of such a devastating weapon it was not used on Iraq. The Soviets did not nuke Afghanistan. The US did not nuke North Vietnam. North Korea and China were not nuked during the Korean War. China has not nuked Taiwan. The former Soviet Union and China have yet to nuke each other despite their animosity. Until they can develop a robot that can do everything a human can do infantry units will not be obsolete. Tanks may become obsolete if powerful anti-tank weapons are developed and deployed. A destroyed bridge can delay the most vicious armored thrust but it takes a lot more than a mere bridge to halt an infantry advance for very long. Manned aircraft may become obsolete if reliable air defenses are developed and deployed. But infantry will always be needed to protect or pacify people from other nations that are not willing to use that final option. As long as infantry units are needed only a foolish nation will neglect them because only infantry units are versatile enough to occupy or defend valuable terrain. Only infantry units can fight in and from the most inhospitable areas known to man and those areas abound on the face of the planet. One policy that the US is trying to implement is the use of foreign troops. Some individuals who never studied history are pushing for a more technological military. It is believed that the US can provide high tech equipment and knowledge while other nations (like NATO or the UN) provide the ground troops. This is supposed to minimize the risk to US personnel. Also, if a massacre or other atrocity is instigated by a less scrupulous ally, the US can easily wipe her hands of the incident. Of course it will be done in the name of protecting US service men and women. Furthermore, it will help justify additional cut backs in manpower. The ancient Roman Empire did something very similar. She hired barbarians to fill her armies and kept her citizens at home. Trivia devotees will not that Rome was over run by barbarian hordes and her cities, full of fat, rich, near defenseless citizens, were plundered.